Starting November 23, both locals and tourists will flock to Daley Plaza to see an incredibly large tree light up, visit Santa, and sample lots of traditional German fare including bratwurst, goulash, and Gluehwein — a spiced wine served piping hot in a commemorative boot mug. The reason for the celebration is Christkindlmarket Chicago, the German fest that takes place in Daley Plaza every year through Christmas. You might be surprised how great an outdoor festival in Winter can be, so grab a pair of earmuffs and your appetite to find out! Savory items at the Fest include potato pancakes topped with sour cream and applesauce, or various types of schnitzel. You can find non-German foods like warm pretzels or hot dogs, if German cuisine isn’t to your liking. I’ve been known to eat churros at the event. Whatever you decide upon, take it to the warming tent to enjoy or stand at one of the outdoor tables if the weather cooperates. Be sure to save room for a stop at The Sweet Castle — no matter how stuffed I am, I never miss it. This German confectionery offers assortments of gingerbread, and German cookies as well as an incredibly large selection of German chocolates & candy, Stollen, popcorn and cotton candy. The two things I never leave without? 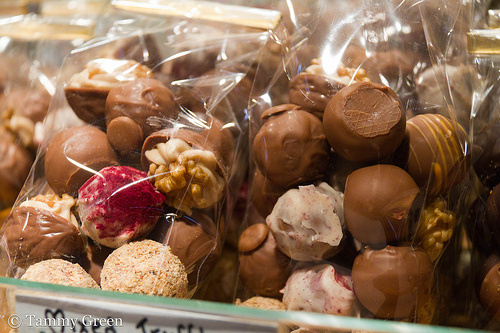 Hot, candied almonds and a bag of luscious chocolate truffles. 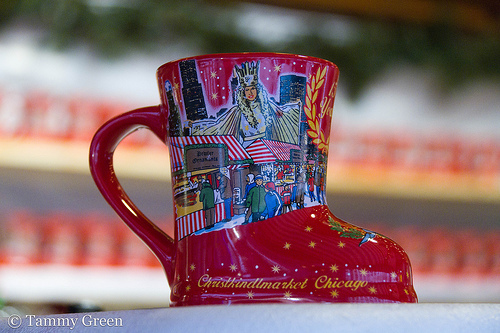 Christkindlmarket Chicago runs until December 24. Don’t miss it! This entry was posted in Dining and tagged Christkindlmarket. Bookmark the permalink. my daughter got engaged last night under the big tree at the market..pretty picture!